This Florida weather has been cray lately! It usually rains all the time in the summer and then in the fall/winter it's pretty dry but it has seriously rained every day since last Thursday and it's a 60% chance every day the rest of this week! I guess I can't complain too much since I'm inside all day but if it was at least bringing some cooler weather that'd be nice! I will admit, the rain makes me want to dress more for comfort than looks though, hence this outfit! This dress is by far one of the most comfy dresses in my closet! The material is super soft and the dress is fitted without being too fitted. Seriously, if you've never tried on a Piko item I definitely suggest doing so immediately! It's my go-to on days where I don't feel like changing out of my pajamas...which is pretty much any rainy day! I decided to pair it with a pair of leopard print sneakers since heels and rain do not go together when you're as clumsy as I am. Those lines painted on the road get extremely slick when wet and trust me, I've ate it a few times walking across them so flats in the rain are the safest choice for me. Another thing I love in the rain is a good hat! I've already accepted the fact my hair is not going to play nice when it's raining out so a hat is the best way to keep my hair from looking like a complete mess. It's also dual purpose since a hat can keep the rain out of your face and keep your makeup looking as fresh as possible! You are the master of casual chic, I adore this entire look from head to toe. This has to be one of my favorite looks on you! I love the dress and extra bonus is how comfy it is! 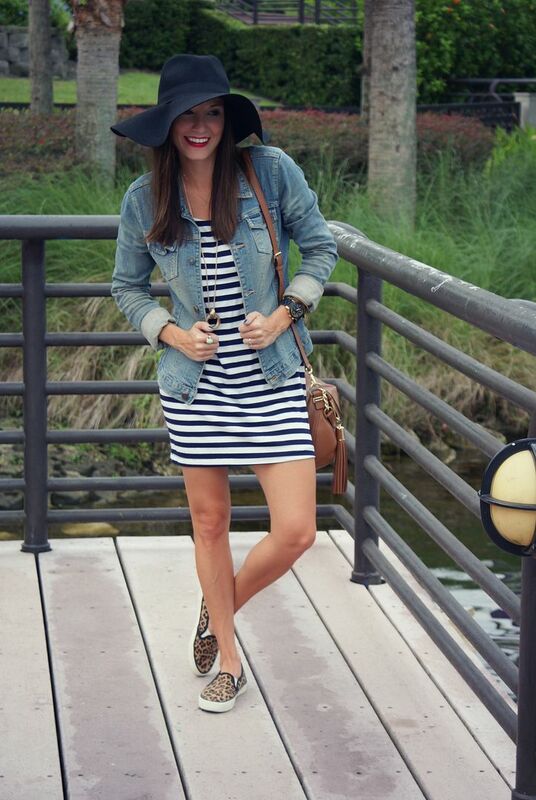 The shoes are the perfect way to mix patterns, and that hat!! I love it! Love this! 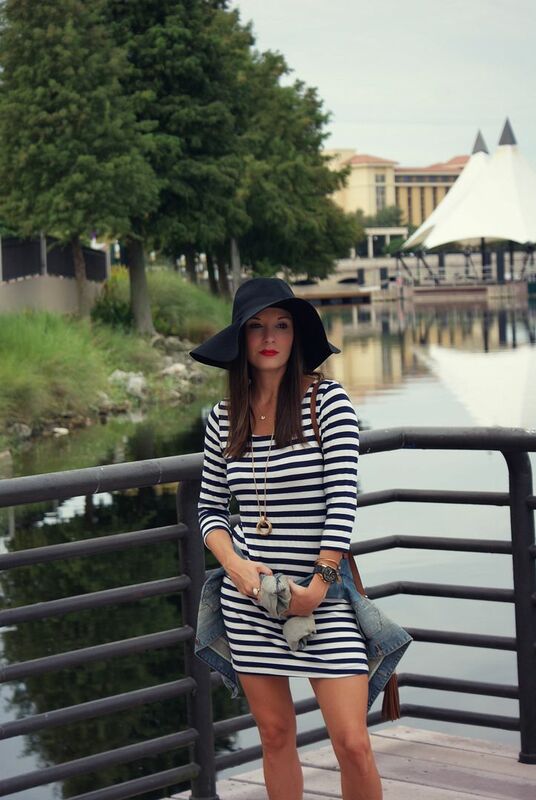 Stripes are one of my absolute favorites! 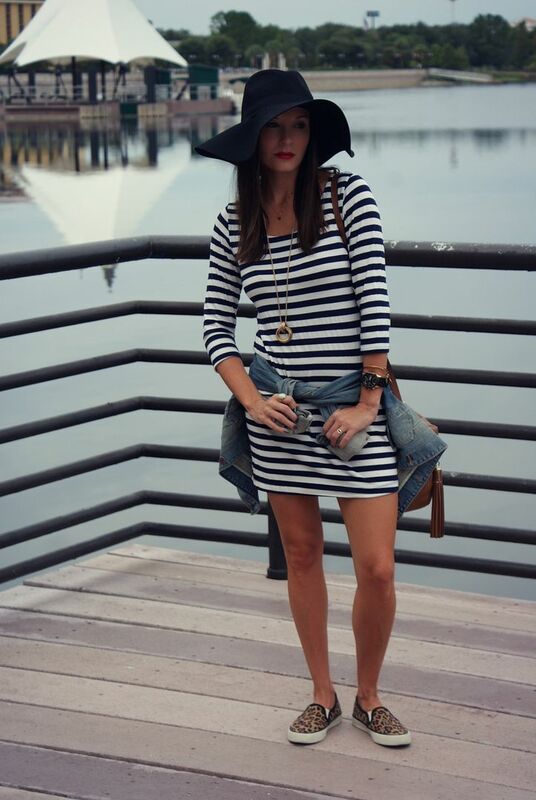 Love how you styled this dress! 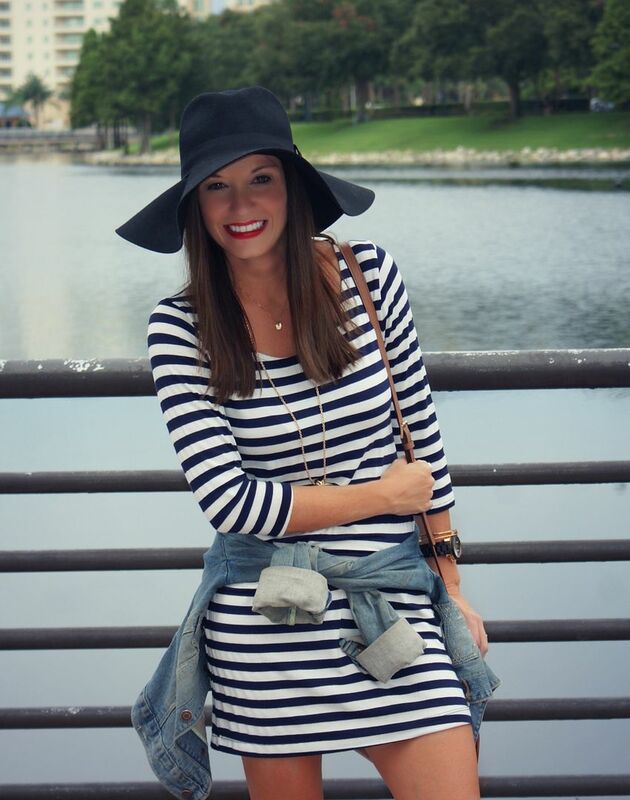 I have been obsessing over stripes lately, this dress is too cute! Love it paired with the denim jacket. Adorable!!!! Heels and rain surely don't mix, you're not alone on that one! I'm loving that hat! And I'm all about the stripes these days! Looking adorable as always!! Love the hat!! I have been looking for a great Fall hat and this one looks like a great affordable option. That dress could not be more perfect on you, and if it's comfortable enough to want to wear on days you don't want to get out of you pjs I'm sold. Love those leopard sneakers as well. This is such a great look! gah i love this dress! love it paired with the denim jacket. i tried to do a similar look and it just didn't look cute - so i definitely need a new striped dress and denim jacket ;) it has hardly rained here yet, i'm waiting for the phase where it rains for a month - ugh. Girl! This outfit looks comfy AND cute! Plus I'm seriously obsessed with your hat! Love it! Love that dress and the jeans jacket is so fabulous!!! I love that dress and have been thinking about getting a Piko top, they look so comfortable and flowy! I have been wanting a striped dress, just like this one...actually I've been eyeing the French Connection one you linked to. You look so chic! Such a great, easy outfit! Of course I'm all about that hat! You know I love everything about this and your legs look ah-mazing! The hat is a necessity for rainy days! Love that dress! loving it with a jean jacket! i always forget about mine but this post just reminded me to pair it with something. loving the hat too! Such a great look Pamela! I am so in love with the stripes and leopard combo lately! Love this look! It's a perfect weekend outfit -- comfy, casual but still stylish. Hoping the rain slows down for you soon! Love that dress! Looks so comfy for this dreary weather! boooo rain. but the new hair is looking cute under the hat!! Loving the hat on you! The mix of patterns is something I still haven't done... but I'm getting closer to trying!? So cute! I've been loving chambray around the waist lately too! I bought Avery a pair of shoes EXACTLY like those and have been looking for a version in my size ever since!!! You totally saved the day! I love love LOVE this look! You look fantastic, girl - I wish I could put together an outfit like you! Hands down, this is a fave look! Way to rock the pattern mix! Such a cute and comfortable look! :) Love the shoes! There's nothing better than a super comfy dress and sneakers and also looks totally put together and cute. Hello perfect outfit!! Love that dress with the floppy hat! It looks so comfortable! 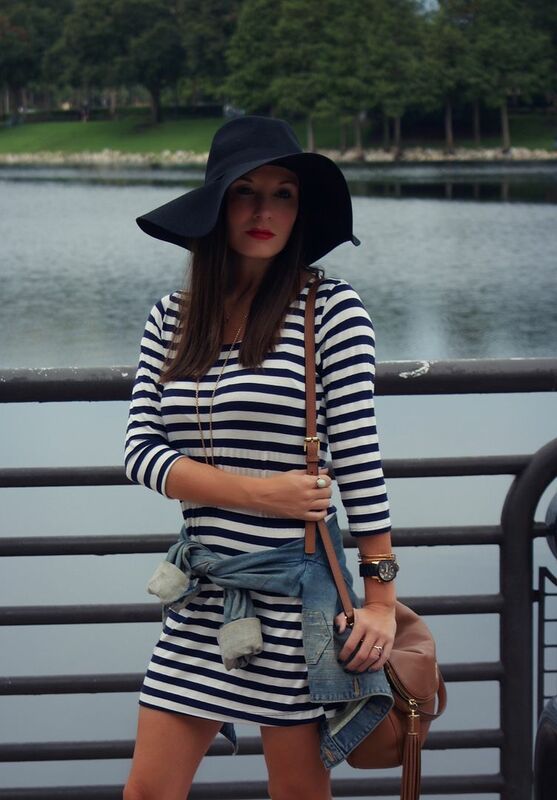 Love the stripes with the denim! And of course the hat looks amazing on you too! Zebra Is A Neutral, Right?